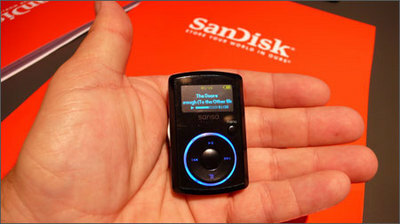 Sansa’s iddy biddy Clip range of MP3 players not only has a relatively massive clip on its back, it now has a whopping 8GB of storage to match. That’s 8GB of storage to house your MP3, WMA, WAV music files and DRM formatted music in. As far as budget MP3 players go, this one’s a great option costing only £45. It doesn’t skimp on the features either, with a built-in microphone, FM radio, OLED display. And at 0.9 ounces it won’t make a dent in your pocket or wherever you plan to clip it with that conspicuous and sizeable clip.